So earlier this week I came down with the dreaded mid-winter cold. Every winter I come down with one real zinger of a nasty cold. Usually right around the end of December or early January (could it be a severe lack of sleep caused by an extremely fussy, teething, 18-month-old, combined with a severe holiday sweet tooth? hmm… maybe!) Sunday night I was feeling just a little off, I had a sort of strange fuzzy feeling in my head and an undefinable “ick.” I just knew something was stirring, that my body was trying to fight off some nasty germs. Monday I awoke with a scratchy throat, watery eyes, and my fuzzy head had morphed into a dull headache. Right away I reached for Emergen-C and Zicam. I swear by this stuff! It takes a while, but I really think it gives your body the boost it needs to fight off any bugs. By Tuesday night, I had a wretched headache, my scratchy throat was better, but I was starting to feel the tell-tale signs of an impending sinus infection. The Zicam was definitely helping but I needed something more. I needed…. Soup! Not just any soup. Magic soup. A warm, comforting, steamy cup of vegetable soup with a sprinkling of nature’s best remedies for kicking a nasty cold to the snowy curb. You see, Mother Earth has provided so many wonderful immune-boosting super foods to help us stay healthy through these hard winter months. 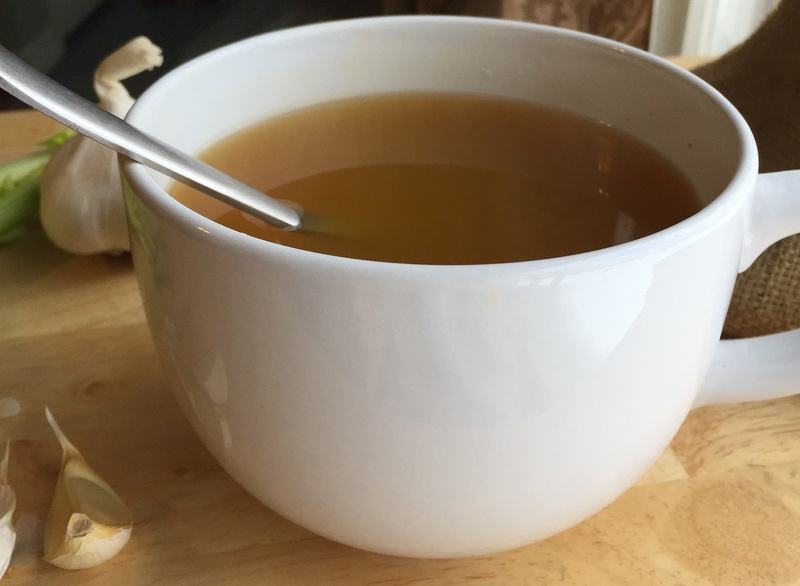 So before you reach for that Nyquil, you just might want to give this cup of soup a whirl! You’ll be feeling better in no time, my sniffling friend! Even without magic add-ins, hot soup is great for a cold. You can hold the warm mug, breathe in the vapors, and sip sip sip to soothe those lousy symptoms. 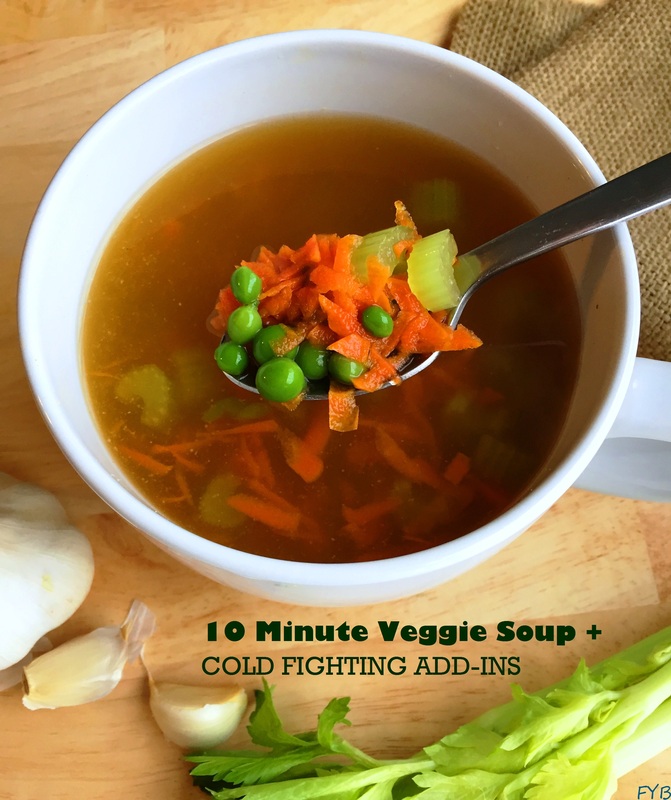 It only takes a quick 10 minutes to cook up my magic cup of soup, and since you’re cooking the veggies right in the broth, you’ll retain all those beneficial vitamins and minerals. Now, back in the day, (ok, like last month) I used to tear open an envelope of Lipton Spring Vegetable when I wanted a hot mug of soup. I decided this week to re-create my go-to veggie cuppa soup. I have to say, it tastes remarkably similar to Lipton, but better (obviously), because it’s made with fresh veggies and not those hard little freeze-dried chunks. This speedy soup is really good for anytime, like when you need a quick, warm, accompaniment to your sammy for lunch, or something light and easy for a late snack. Really, though, my main reason for making this soup this week is that it makes the perfect vehicle for my favorite natural cold buster, garlic. Garlic has amazing anti-viral, anti-bacterial, and anti-fungal properties. It has been consumed for medicinal purposes by many different cultures for hundreds of years. A study conducted in 2001, published in the journal Advances in Therapy, found that subjects who took garlic supplements for the 12 weeks between November and February caught 46% fewer colds than those who took a placebo. Garlic contains allicin, a sulfuric compound that produces powerful antioxidants as it decomposes and has been found to stimulate the immune system in laboratory tests. 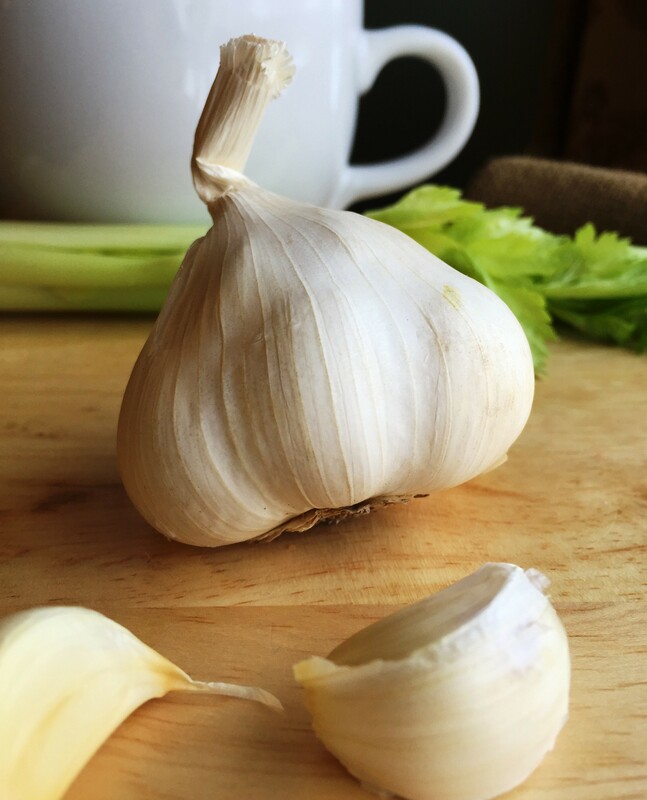 Although few clinical studies exist to explain garlic’s efficacy in treating the common cold, anecdotal evidence abounds. I can say that it always works a charm for me! The trick is finding a way to eat it in it’s most effective form: raw, and immediately after being crushed or pressed. Fifteen years ago, when I was just a young college student, my dear aunt mixed me up a concoction to chase away a mean cold I had been suffering with. She’s so sweet and helpful, and totally “in the know” when it comes to natural remedies. She handed me a steaming mug filled with hot tea, lemon, honey, and pressed garlic. It probably would’ve worked but I was so freaked out about the floating chunks of pungent garlic, that I just couldn’t finish it! We still laugh about my reaction to her “cold cure,” but I totally credit my aunt with introducing me to the powerful effects of garlic! For some reason, I have an easy time getting the garlic down when I mix it into a cup of vegetable soup. I think it’s because it sort of blends in with the bits of veggies and spices in the broth. I made this recipe twice, I had one mug Tuesday evening and two more on Wednesday. By Thursday, I felt MUCH better. Today I awoke to find all of my symptoms completely gone! Now that’s magic! Combine all ingredients except garlic cloves in a small pot and bring to a boil. Reduce heat and simmer for a few minutes, just until veggies are crisp-tender. Pour half into a mug. Save the rest for later (store in a air-tight container in the fridge). Allow the mug of soup to cool slightly. Peel your garlic clove and use a garlic press to crush the garlic. Use a knife to scrape the garlic into the mug of soup. Drink the soup right away! Other foods you might want to nosh on to help shorten or prevent a cold: Citrus fruits, red peppers, strawberries, yogurt, brazil nuts, almonds or sunflower seeds, sweet potatoes, oats, fennel, anise seed tea, green tea, or black tea. Please share! What is your favorite way to kick a cold fast?